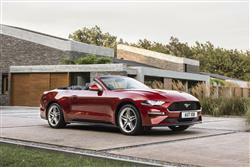 You could really form a bond with Ford's latest Mustang in Convertible form. Jonathan Crouch reports. You'll pay a £1,500 premium to own this Convertible Mustang over the Coupe version. Another £1,500 premium buys you automatic transmission. That all means prices starting at around £34,000 for the 2.3-litre variant, rising to £40,000 for the full-fat automatic 5.0 V8 GT drop-top variant. Equipment-wise, all models get 19in alloys, leather seats, two-zone climate control, an 8in colour infotainment touchscreen, a reversing camera and automatic lights and wipers. The GT spec you get with the V8 further adds Brembo brakes, a fussier alloy wheel design, a very slightly different grille, launch control and a couple of 'GT' badges. Safety's been improved, this enhanced model now featuring autonomous braking - Ford calls it 'Pre-Collision Assist with Pedestrian Detection'. The Mustang is also now offered with Adaptive Cruise Control and Distance Alert technologies that help drivers maintain an appropriate distance to the vehicle ahead, as well as Lane Departure Warning that can warn when drivers unintentionally drift out of lane, plus a Lane Keeping Aid that can apply torque to the steering wheel to steer the vehicle back into lane. This revised model has a classier feel, both inside and out - and the extra driving modes, additional safety features and 10-speed auto gearbox are all welcome additions. None of this though, has diluted this Ford sportscar's essential charm. A Mustang is all about the noise it makes, hence the appeal of this Convertible version. Without a roof, the 5.0-litre V8 should sound just great but Ford says it's tuned the alternative 2.3-litre EcoBoost engine to make nearly as potent a noise. What that smaller engine will do is make the option of Mustang ownership available to more people. With a folding roof, a 5.8-second sprint to 62mph and almost acceptable fuel economy, this variant might be empting. After all, there aren't many ways of getting this much heritage and this much drama onto your driveway for this kind of budget. Go on: try one.